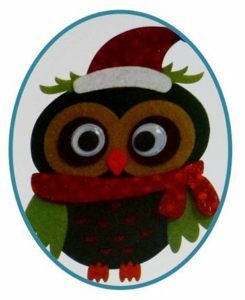 Felt craft kits, Owls Christmas. | Cross Stitching Heaven. 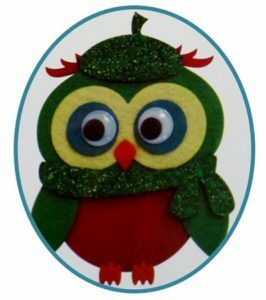 Felt craft kits, Owls Christmas. 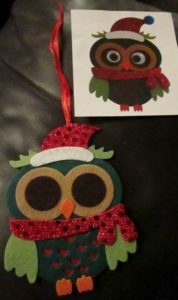 Not cross stitch but instead, some fun felt craft kits I picked up in a local craft shop – Christmas Owls. For a change, I thought I would spend a little time completing these with the children during the Christmas holidays. This is the felt craft kit laid out straight from the packet. 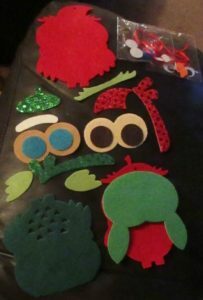 All the pieces are ready cut self-adhesive felt or decorative sparkly felt. The little bags have ribbon, googly eyes, felt feet, beaks and pompoms in to add the finishing touches to each owl! Felt craft kits provide the perfect way to introduce your child to crafting. They are fun to make, brightly coloured, pleasant to the touch and the felt kits come in a variety of different shapes and sizes ranging from cars to birds and animals. I personally love these type of kits as they are so easy to make. Your child can produce a beautiful gift with very little effort. This is what the kits should look like when we’ve finished. You can find a small selection of kits to purchase here! We built each owl up layer by layer. I first made sure the children knew where each peice should be located, by “building” the owl first, before peeling off the protective sticky backing paper.